Waiting to welcome guests are smiles from the heart, greetings that are warm, sincere and courteous. 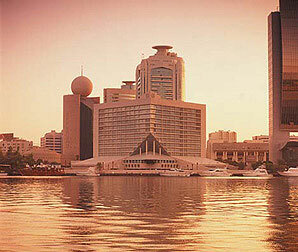 The Sheraton Dubai is one of nearly 450 Sheraton luxury, upscale and midscale hotels and resorts which provide superior facilities and quality service to business and leisure travellers in more than 65 countries worldwide. Panoramic windows in each of the newly refurbished guest rooms offer uninterrupted views of the Dubai Creek and city. Numerous amenities such as an eye-level data port, Interactive TV, and personal safe will guarantee your stay is one-of-a-kind. Beautifully designed Japanese rooms offer guests a unique Asian experience. Located on the top floors of the hotel, the Towers floors provide 24-hour personalized butler service to ensure that each and every request can be immediately and efficiently addressed. Floor-to-ceiling windows directly overlooking Dubai Creek are the main features of the newly refurbished Abjar royal suite and the Habari and Rasha presidential suites.